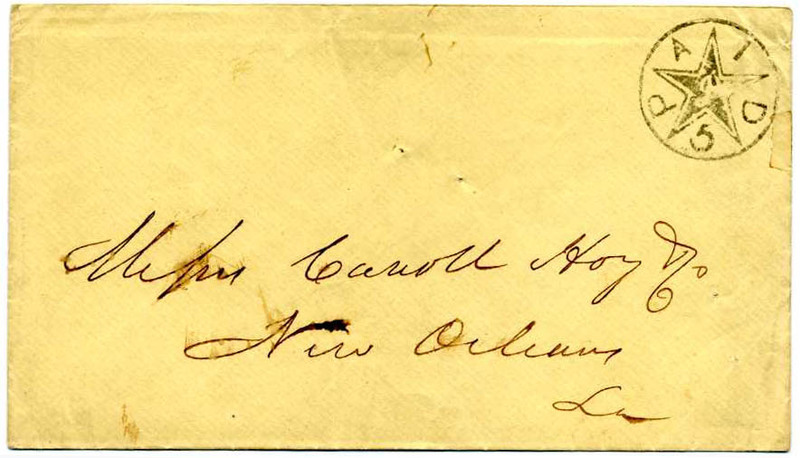 New Orleans La., pair of 5¢ brown on white #62X3 tied by indistinct strike of June New Orleans cds on cover to "Hon. 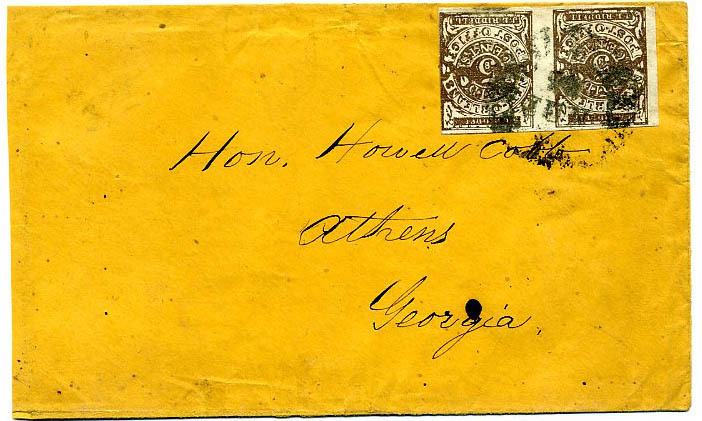 Howell Cobb, Athens Ga.", slightly reduced at left, one of the most popular addressees among Confederate collectors. CSA Maj. Gen. Howell Cobb (1815-1868) was an illustrious U.S. and Confederate politician and major general September 9, 1863. Much more information on linked page. Memphis, Tenn., 5¢ red vertical pair #56X2, tied by Memphis, Ten., Nov 23 cds on narrow commercial cover to Charleston, S.C., Fine, with 1989 C.S.A. certificate, signed Dietz. SCV $3,500. Memphis, Tenn., 5¢ red #56X2 vertical pair, mostly large margins, small margin tear , tied neat Memphis town cancel on cover, reduced a bit at right and tiny edge tears, fresh and attractive use, 2008 SCV $3,500. Memphis, Tenn., 5¢ red #56X2 deep color with piece of adjacent stamp showing at top, neatly tied by town cancel on immaculate cover, Extremely Fine Gem, Ex Matz, 2008 SCV $1,750. 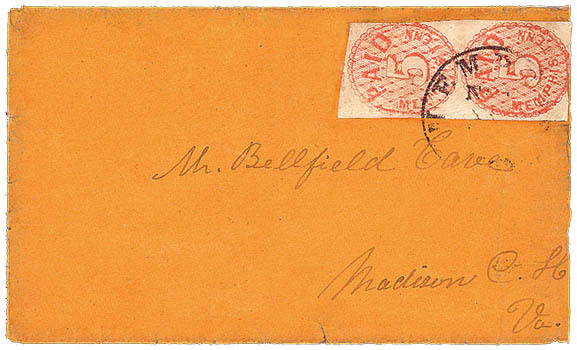 Memphis, Tenn 5¢ red postmaster provisional #56X2 tied on small neat cover to Nashville, flap faults, 2008 SCV $1,750. 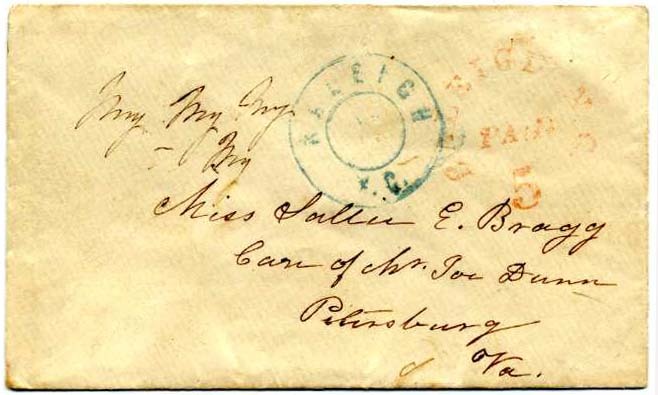 Charleston, S.C. 5¢ blue #16X1, horizontal file fold through stamp, tied by CHARLESTON / S.C. / DEC / 4 / 1861 cds on folded business letter to “Revd H.A. Tupper, Washington, Geoa”, Ex Kohn, SCV $2,500. $1,250. Columbia, S.C. 5¢ blue #18XU4a handstamped postmaster provisional with control seal on back, July 10 town cds on cover to “Capt. Allen J. Green, Kershaw’s Regiment So Ca Volunteers, Fairfax C.H., Virginia, cover bit reduced at right otherwise Very Fine, ex Wm A Fox. SCV $1,250. $850. 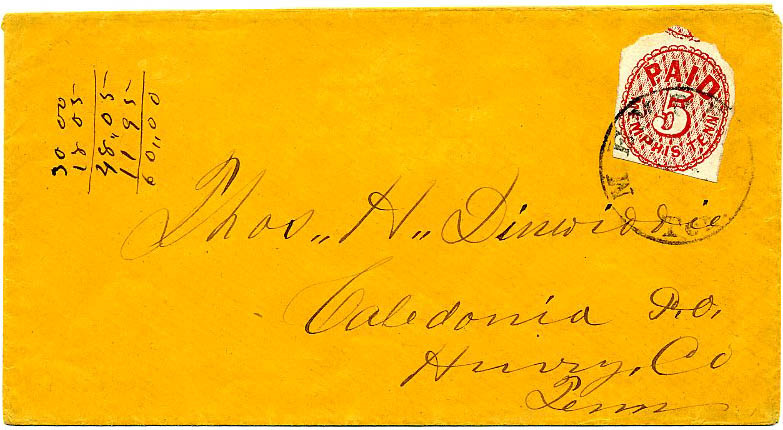 Memphis, Tenn. 5¢ red #56X2 cut to shape and tied on cover by Nov 1861 town cancel on neat cover to “Dr. 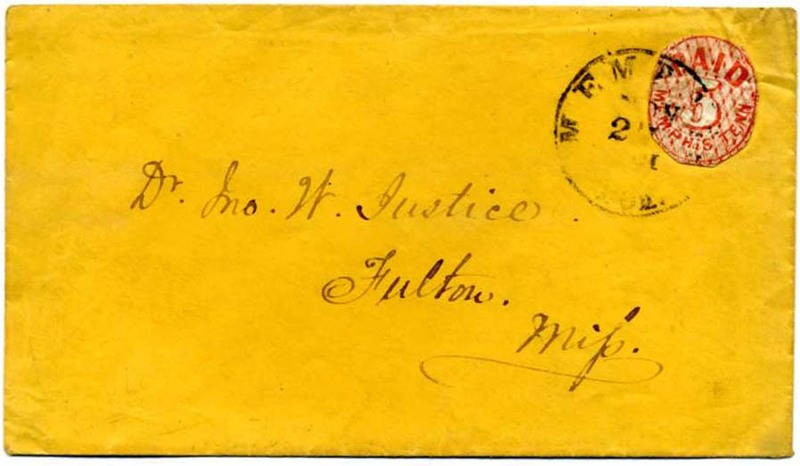 Jno W. Justice, Fulton, Miss.” Scarce and desirable. $1,000. Memphis, Tenn., 5¢ red #56X2, tied by town cancel on cover to “Mrs. William H. Wilson, Shawnee Village, Ark.”, Very Fine, 2008 C.S.A. certificate. SCV $1,750. Raleigh, N.C. 5¢ red #68XU1 handstamped provisional with blue November double circle town cancel on lovely pale pink cover, excellent strikes, a charmer.SCV $600. 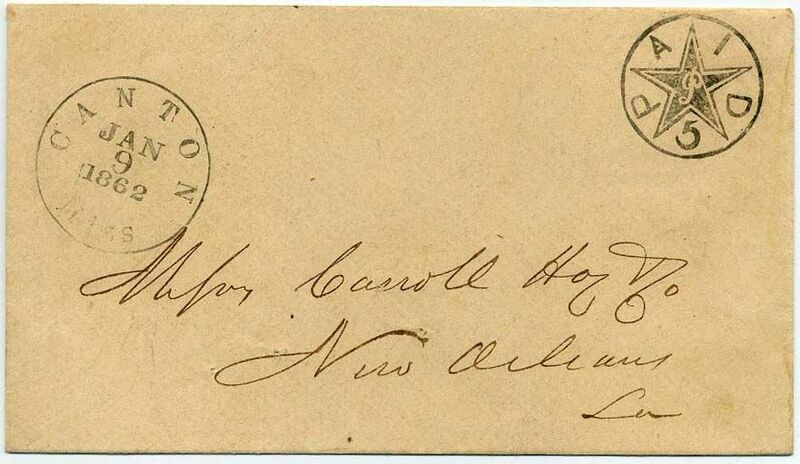 Canton, Miss 5¢ black #14XU1 handstamped provisional no cancellation but addressed to Carroll Hoy & Co., New Orleans with usual pin holes for this correspondence. The negative “P” in the center of the star stands for the last name of the postmaster, William Priestley. SCV $4,000. 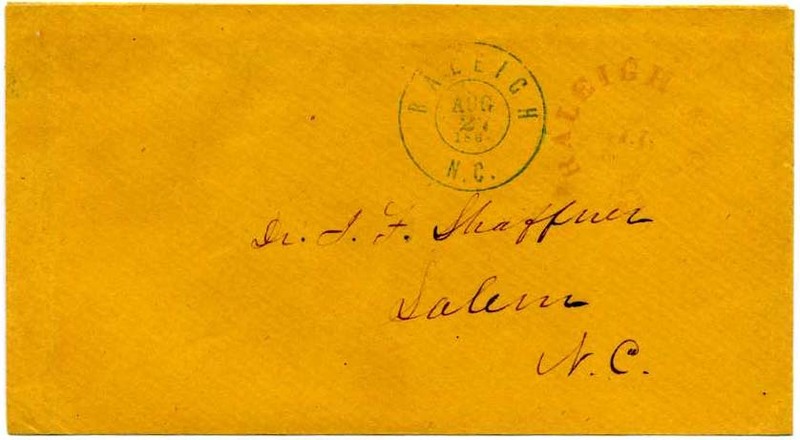 Raleigh, N.C. 5¢ red #68XU1 handstamped provisional with blue Aug 27, 1861 town cancel on pristine orange envelope to “Dr J . F. Shaffner, Salem, N.C.”, top back flap missing, docketing re contents on back flaps, SCV $600. $400. 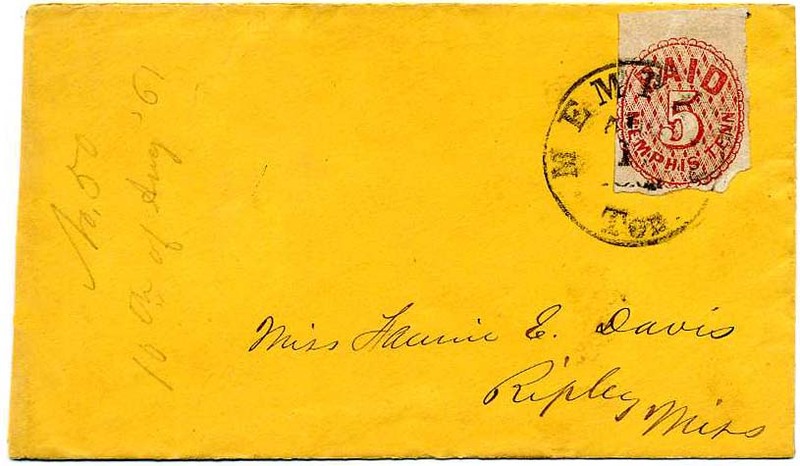 Raleigh, N.C. 5¢ red #68XU1 handstamped provisional with blue town cancel on small ladies cover to “Miss Sallie E. Bragg, Care of Mr. Joe Dunn, Petersburg, Va.”, flap faults, 2010 SCV $600. Ex John Luff. $550. 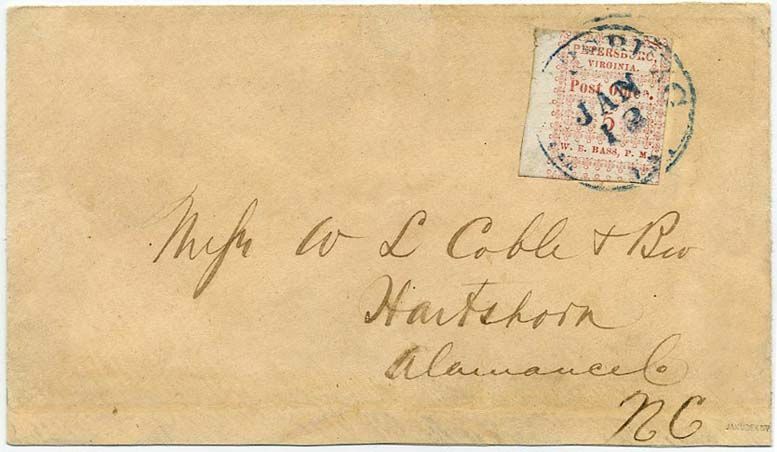 Charleston, S.C. 5¢ blue #16X1 tied light double circle town cancel on narrow commercially made cover to Miss A M. Hagen, High Point Female College, High Point, N.C., tiniest cover edge faults, 2011 SCV $2,500, 1989 CSA certificate #01869. $2,000. Memphis Tenn., 5¢ Red #56X2, two singles, slightly overlapping – the left of which is a large right sheet margin, tied together by neat MEMPHIS / Ten. // JUL / 28 / 1861 CDS on cover to “Honl A[lexander] H. Stephens, Vice President C.S.A., Richmond, Va., usual docketing on back indicates letter was sent by president of Memphis Chamber of Commerce in relation to Confederate finances, left stamp has light vertical crease, slightly reduced at right and tiny edge tears at top. A scarce multiple-rate use, ex Kaplan, with 1961 Raynor Hubble certificate / invoice to Mrs. Richard House. SCV for a single on cover is $2,000, for a pair on cover is 4,000. $1,500. Macon, Ga., 5¢ black on light blue green, comma after "OFFICE" #53X1, tied by light Macon double circle town cancel on cover to the Clerk of the Superior Court at Perry, Georgia; front of cover over-written contemporaneously, otherwise Very Fine and exceedingly rare on cover. SCV $7,500. $7,000. 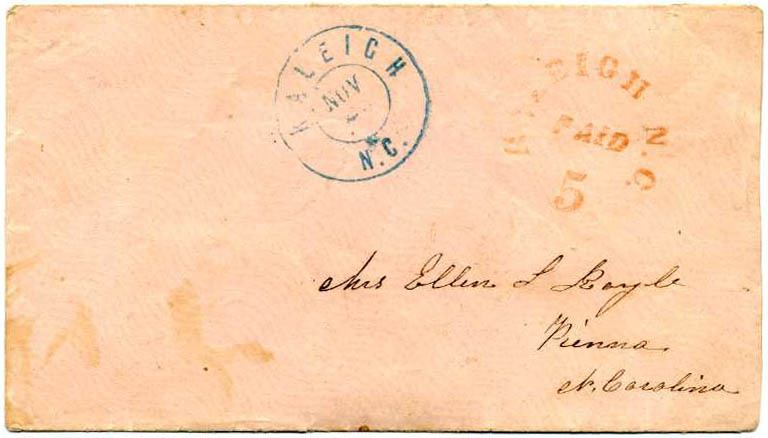 Raleigh, N.C. 5¢ red #68XU1 (RAL-NC-E02) handstamped provisional entire addressed to Genl. S. F[inley] Patterson, Patterson, Caldwell Co., N.C.; clean cover with small restored corners at UL and LR; Patterson was a politician, planter and businessman who served the in the NC senate as well as other illustrious positions over the course of his life. SCV $600. $300. Memphis,Ten. 5¢ red #56X2 top sheet margin single irregularly separated at bottom but design intact, tied by neat strike of MEMPHIS / TEN. 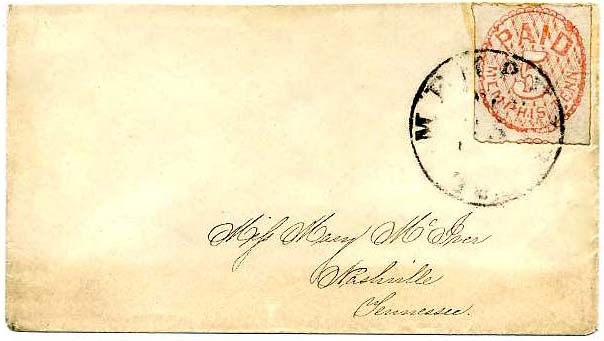 // AUG / 10/ 1861 circular datestamp on cover to Miss Fannie E. Davis, Ripley, Miss; faintest cover reduction at left, lovely pristine use SCV $2,000. $1,800. 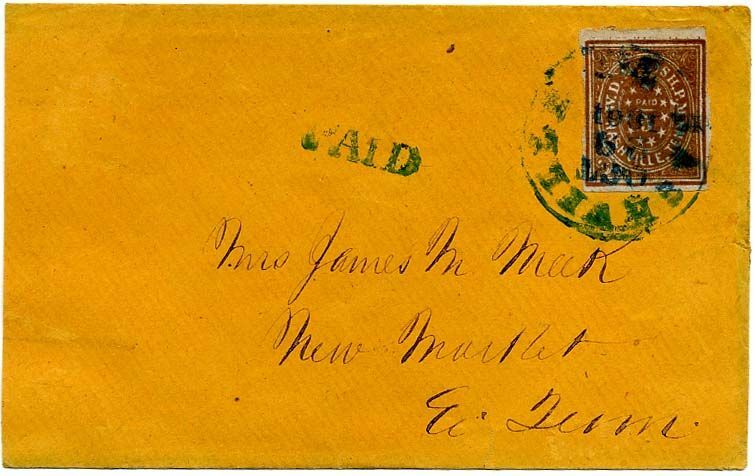 Atlanta, Ga. 5¢ black #62XU2 handstamped postmaster provisional entire, uncanceled but contemporaneously addressed Mrs. John Dearing Care of Dearing & Wetherill, Memphis, Tennessee so most likely went through the mail, beautiful strike on pristine cover; CCV $500 as unused, $750 as used. $450. Charleston, S.C. 5¢ blue #16X1 tied by neat town cancel on cover to Maj. Henry Summer, Secty. B. of Trustees Newberry Col[lege] Newberry C. H., S.C. 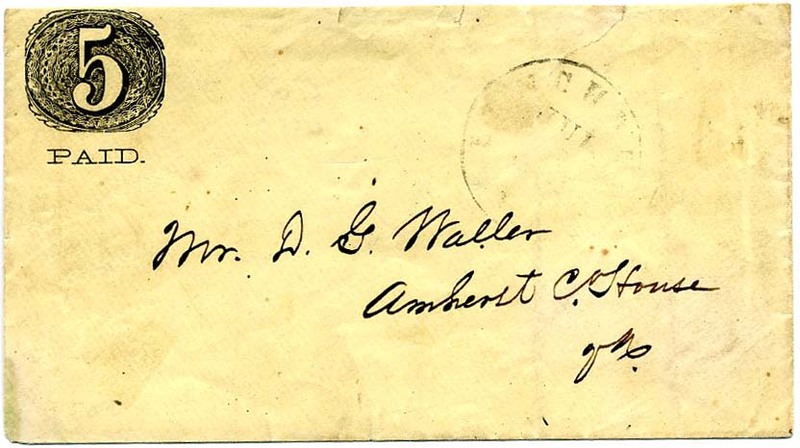 Original letter headed jany 2nd 1862 to Maj. Summer from Rev. John Bachman. Damp stains showing slightly on cover and much more so on letter with resulting holes. None the less quite legible in dark pen. Bachman is concerned with the great difficulty of those in the lower country and especially from Charleston and suggesting that they bring their meetings nearer to each other for the sake of all. SCV $2,500. The Rev. John Bachman (1790-1874) was a gifted, industrious man with many talents and interests. He served the same Charleston, South Carolina church as pastor for 56 years. Much more information on linked page. 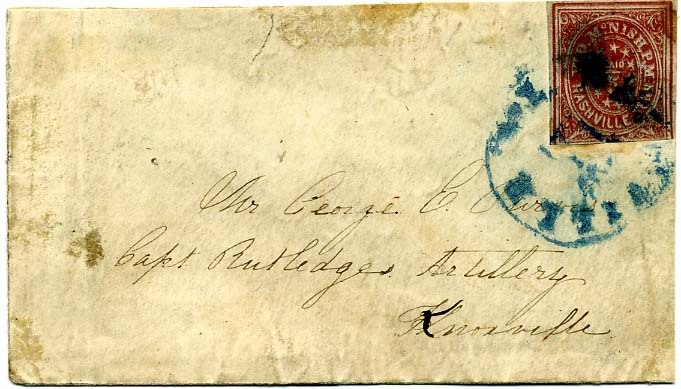 Raleigh, N.C., 5¢ red #68XU1 entire with light red provisional handstamp, blue Raleigh N.C. Oct. 24, 1861 double-circle datestamp on cover addressed to Lt. Col. (later BRIGADIER GENERAL) Bradley T. Johnson, 1st Maryland Regiment, 3 Brigade under Genl. 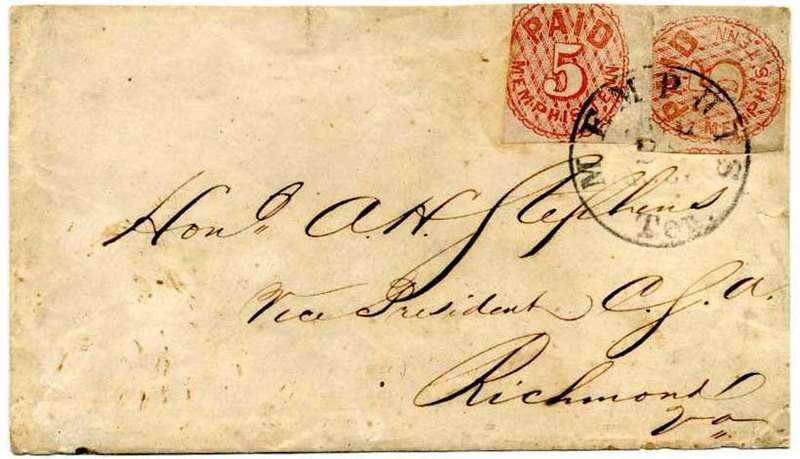 Elzey, Centreville Va.; 1861 pencil docketing, small part of flap missing, Ex Northcutt, SCV $600. $650. Brigadier General Bradley Tyler Johnson (1829-1903) enlisted as a Major with promotion to Colonel in 1862 and then Brigadier General 6-28-64 in the illustrious 1st Maryland Regiment which he had a hand in forming. He was the representative Marylander in the South. He graduated from Princeton in 1849 and finished his legal degree at Harvard. Nashville, Tenn., 5¢ brick red horizontal pair tied by blue NASHVILLE / Ten. // SEP/ 7 / 1861 cds on cover to Mrs. Geo. A. Tuthill, Mobile Ala., some gum staining, top back flap faults. The Crown survey lists only six pairs for all of the red shades (61X2 and 61X3); there are probably only two or three pairs known on cover. RARE USE OF NASHVILLE PAIR. Ex Catherine Manning, Hart, Boshwit. SCV $7,500. $4,250. 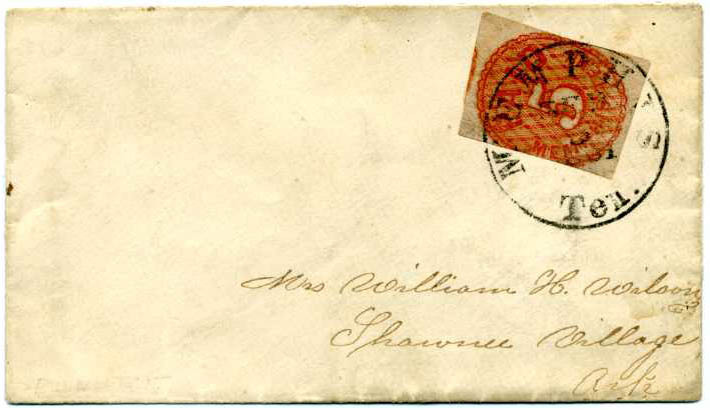 Raleigh, N.C., 5¢ red, clear strike of red provisional handstamp on pristine cover with blue RALEIGH / N.C. // DEC / 18 cds to Thomas Webb, Hillsboro N.C., Very Fine – Choice! This is listed on page 527 of the Crown survey. SCV $600. $850. 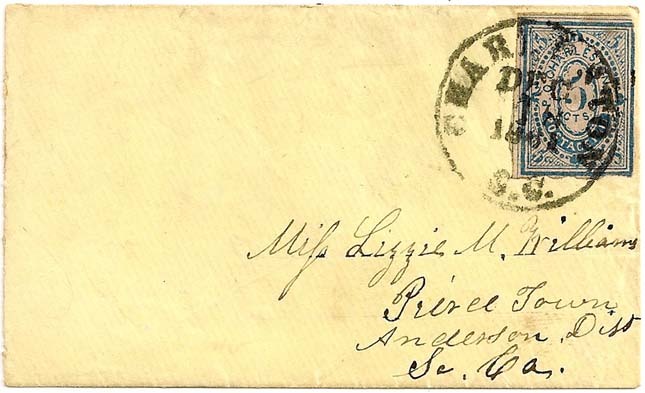 Charleston, S.C. 5¢ blue #16X1 tied neat Dec. 18, 1861 town cancel on small lemon cover to Miss Lizzie M. Williams, Pierce Town, Anderson Dist, So. Ca. ; SCV $2,500. $2,000. Nashville Tenn., 5¢ brick red #61X3, margins to in, few flaws, tied by indistinct blue Nashville cds on cover to George E. Purvis, Capt. Rutledge's Artillery, Knoxville (TN), slightly reduced at right, cover wear, and top flap added. The period photo was taken of Rutledge’s officers in May 1861 and appears in The Photographic History of the Civil War…:Forts and artillery by Francis Trevelyan Miller and Robert Sampson Lanier (1911). Captain Rutledge was promoted to be major of artillery and assigned to duty on the staff of General Leonidas Polk. SCV $3,500. $1,900. 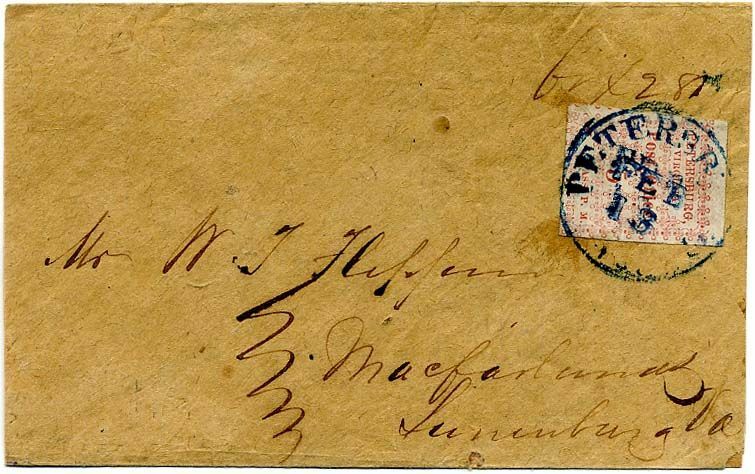 Nashville, Tenn 5¢ violet brown #61X5, 4 margins from large to ample, tied by neat blue town postmark dated Oct / 29 / 1861 with strike of matching blue PAID to the left on pristine cover addressed to Mrs. James M. Meek, New Market, E. Tenn; cover slightly reduced at left. 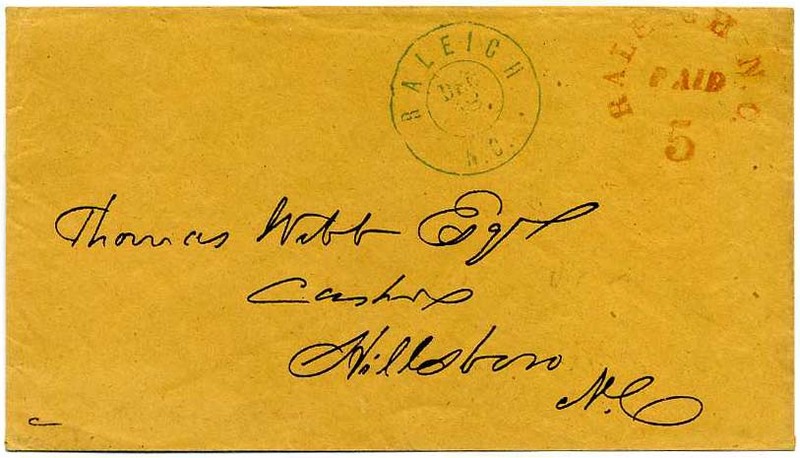 Stellar provenance of Ex Brooks, Emerson, Meyerson and guarantee backstamp and signature of Stanley B. Ashbrook as well as initials “CJP” of Charles H. Phillips. 1998 PF Certificate. A choice rarity. $5,250. James Monroe Meek (1821-after 1899) The Meek family correspondence is housed at the University of Notre Dame in the Special Collections section. Much more information on linked page. Columbia, S.C. 5¢ blue postmaster provisional entire #18XU4a with oval control marking on verso; cover folded over slightly at top so edge wear only shows on verso. 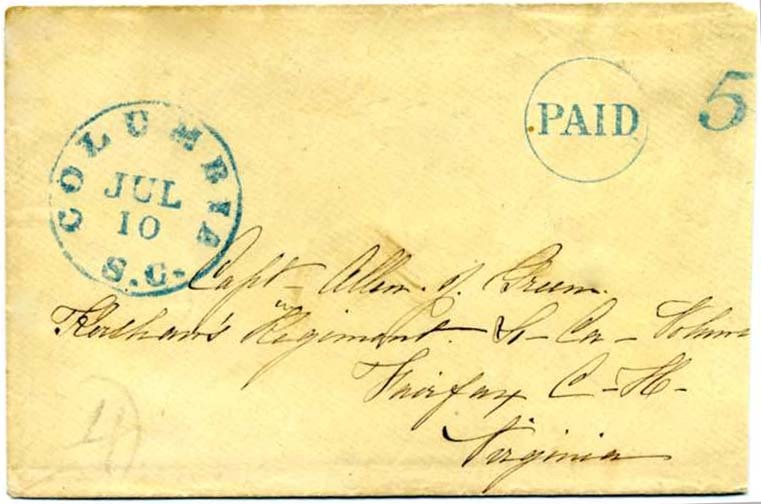 Extremely Fine markings; addressed to Concord NC,SCV $1,250. $800. 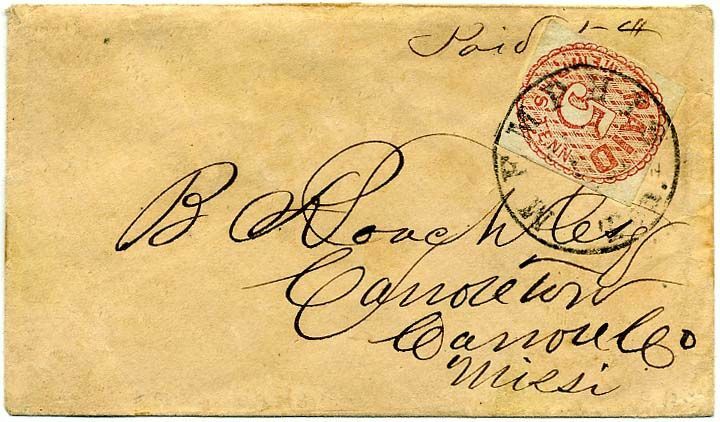 Memphis, Tenn 5¢ red #56X2 tied by town postmark on cover to B. Rauch Esq, Carrollton, Miss; flap faults, Very Fine, SCV $2,000. $1,500. 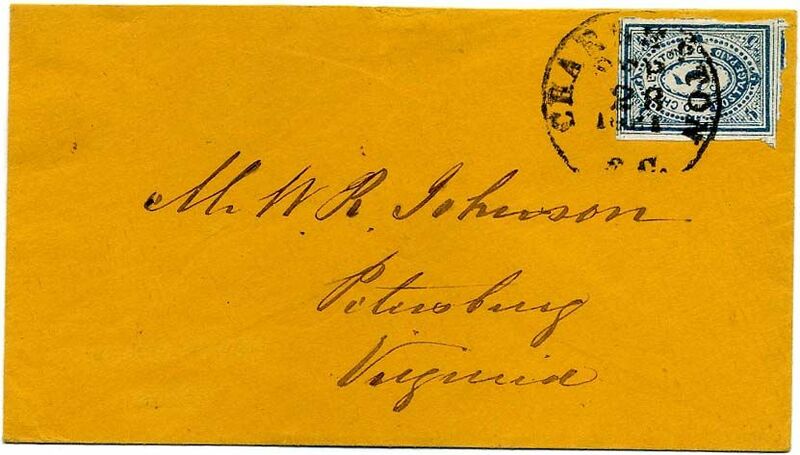 Petersburg Va. 5¢ Red #65X1, position 2 with sheet margin at top, tied by blue PETERSBURG / Va. // FEB /13  cds on homemade cover to Macfarlands, Va.; stamp with light crease and cover barely reduced at sides, Very Fine, SCV $2,500. $2,000. 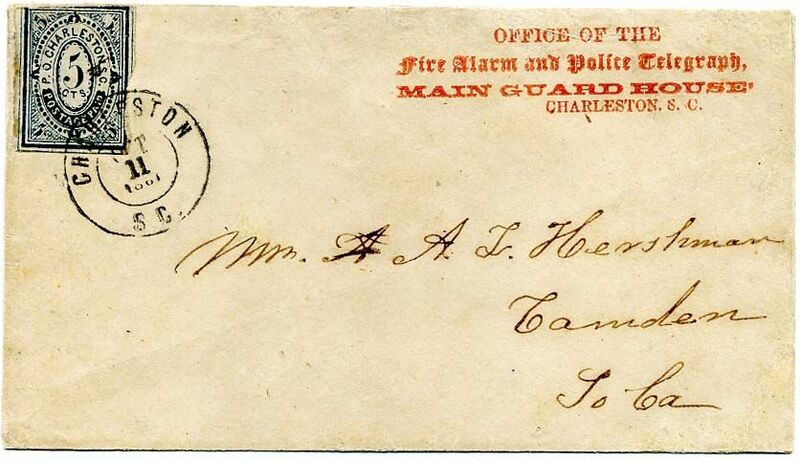 The Fire Alarm and Police Telegraph system was installed in Charleston by John Nelson Gamewell, a Camden S.C. postmaster and telegraph operator who purchased rights to the system in 1855 (the Gamewell Fire Alarm Company still exists). Much more information on linked page. Charleston S.C., 5¢ Blue #16X1 with mostly large but irregular margins showing large parts of outer frame lines, slightly in where unevenly separated, tied by Charleston S.C., Nov. 5, 1861 cds on J. N. ROBSON COMMISSION MERCHANT'S CORNER CARD cover to Concord N.C.; Fine, a scarce corner card cover, the Calhoun census lists approximately 14 examples on corner card covers, but many are embossed and do not clearly show the design. $1,500. 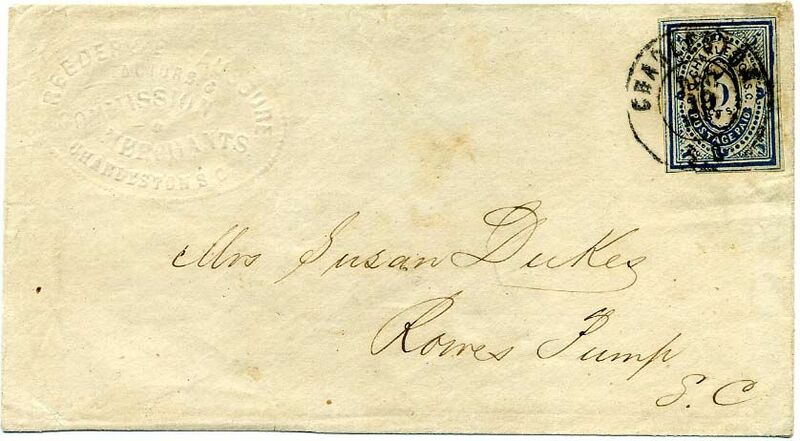 Charleston S.C., 5¢ Blue #16X1 with huge margins showing outer frame lines all around, rich color, tied by Charleston S.C., Dec. 19, 1861 dcds on cover to Mrs. Susan Dukes, Rowe's Pump S.C. with EMBOSSED ADVERTISING CORNER CARD FOR REEDER & DESAUSSURE, FACTORS AND COMMISSION MERCHANTS at upper left, Very Fine. Only 14 corner card covers with the Charleston provisional are recorded in the Calhoun census. 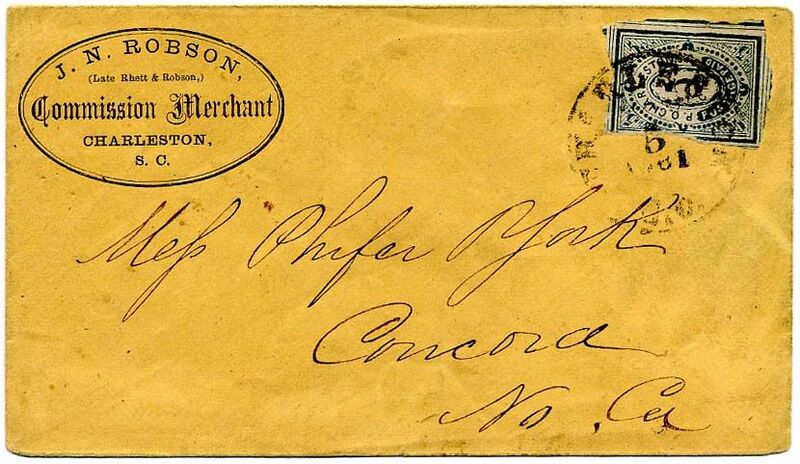 This cover is postmarked one week after the Great Fire of 1861 decimated 15% of the city, with 1986 CSA certificate. Illustrated in the Calhoun book on p. 79. $3,250. Charleston S.C., 5¢ Blue #16X1 with large margins showing 3 complete outer frame lines and parts of adjoining stamps at top and bottom, tiny scissor separation cut at top right, tied by Charleston S.C. Sep. 28, 1861 cds on pristine cover to M. W. R. Johnson, Petersburg Va., barely reduced at top with sealed flap tear, Extremely Fine. ONE OF THE FINEST CHARLESTON PROVISIONAL COVERS EXTANT. SCV $2,500. $4,250. Charleston S.C., 5¢ Blue #16X1 with two singles originally forming a vertical pair, Types K and R, tied by Charleston S.C., Oct. 27, 1861 dcds on small cover to Mrs. N. F. Phillips Care of Tandy & Williams, Richmond, VA.; right stamp lifted to examine margins of bottom stamp and hinged in place, stamps with trivial wrinkles, slightly reduced at top, light file fold across top and couple pin holes, still Very Fine, SCARCE DOUBLE-RATE USE - only seven covers are recorded bearing more than a single, illustrated in the Calhoun book on p. 61. SCV $5,000. $3,000. 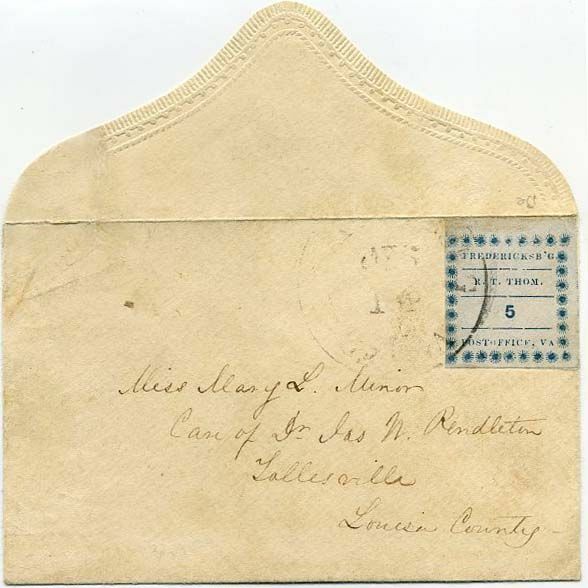 Charleston S.C., 5¢ Blue #16X1 tied by Charleston S.C., Dec. 6, 1861 cds on cover to Mrs. J. J. Morton, Cross Hill, Cross Hill, S.C.; stamp with few faults, reduced at left and some overall wear otherwise Fine, the General Issues went on sale in Charleston the day after this was sent. SCV $2,500. $825. 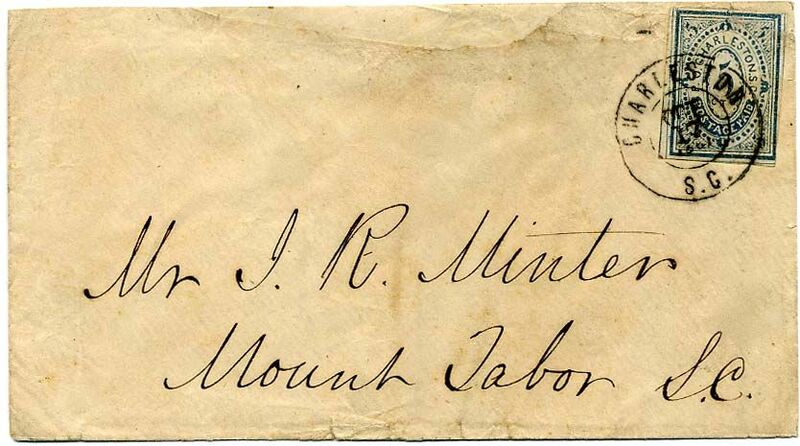 Charleston S.C., 5¢ Blue #16X1 tied by Charleston, S.C. Oct. 17, 1861 dcds on cover to J. R. Minter, Mount Tabor. 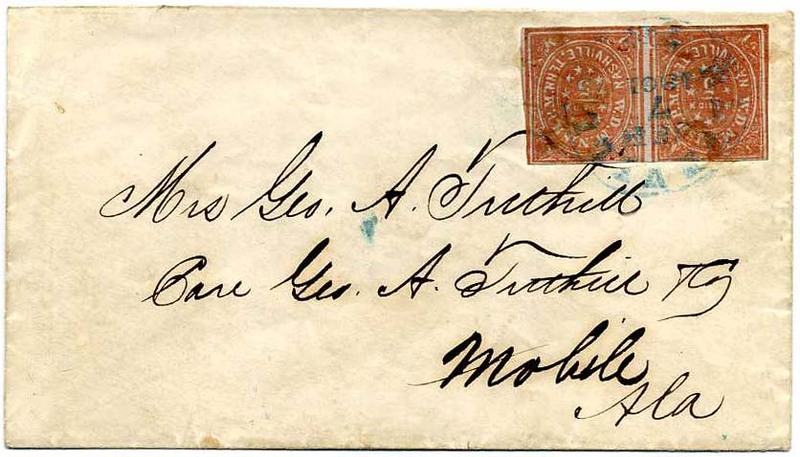 S.C., missing part of top flap and cover repair at top, stamp with scuff at top center, Very Fine appearance. John R. Minter was a store keeper and farmer before and after the war, as well as the postmaster at Mount Tabor until the war began. SCV $2,500. $700. Fredericksburg, Va., 5¢ blue #26X1, position 2 top sheet margin single, tiny corner tear at top right, well away from design, tied by light strike of Fredericksburg cds on darling small ladies' cover to Miss Mary L. Minor, Care of Dr. Jas N. Pendleton, Sallesville, Louisa County (Va), cover has a small repair at upper left extending to the decoratively embossed back flaps the top one of which displays beautifully open, Extremely Fine, a rare provisional on cover; with 1999 P.F. certificate, SCV $5,500. $5,000. Mary L. Minor was the daughter of Professor John B. Minor (University of Virginia), an Episcopalian who operated a Sunday School that included a school for slaves. Much more information on linked page. 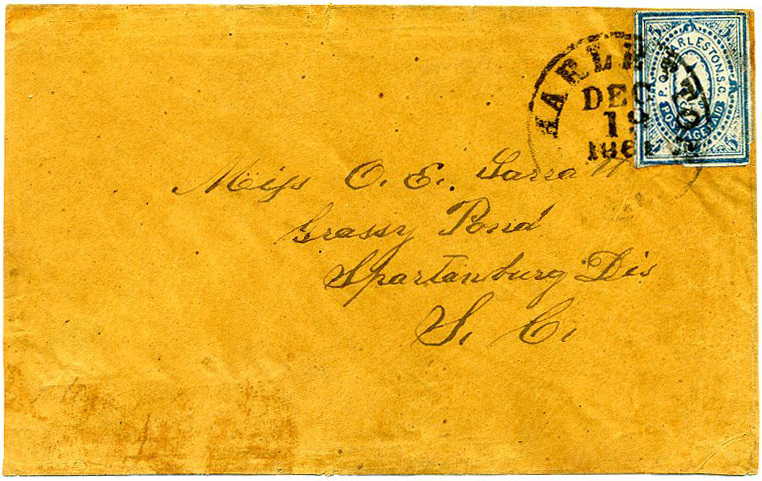 Petersburg, Va., 5¢ red, position 1 left sheet margin, tied by blue Petersburg / Va .// Jan / 12/  on cover to Messrs W. L. Cobb & Bro., Hartshorn, Alamance Co. N.C., expert cover restoration at bottom and bottom flap added, tiny Jakubek authentication handstamp at lower right, Very Fine appearance, SCV $2,500. $1,900. 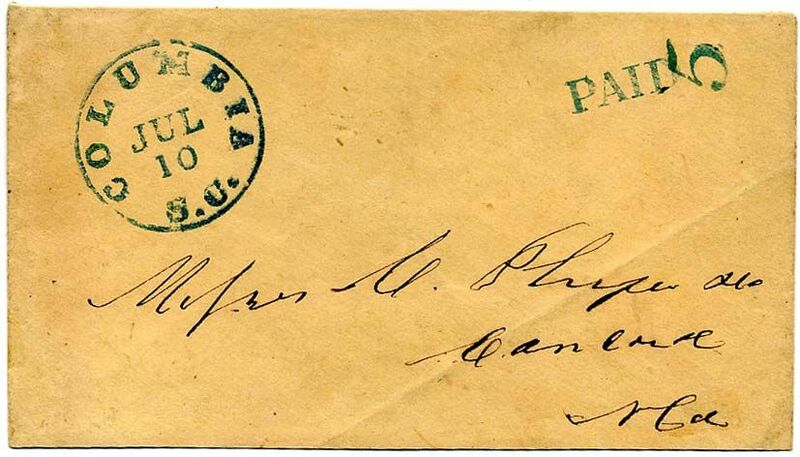 Canton Miss., 5¢ black entire #14XU1, bold strike of “PAID / 5 / P” Star in Circle provisional handstamp and clear strike of Canton / Miss.// Jan / 9 / 1862 cds on cover to Carroll Hoy & Co., New Orleans; Extremely Fine. SCV $4,000. $4,500. 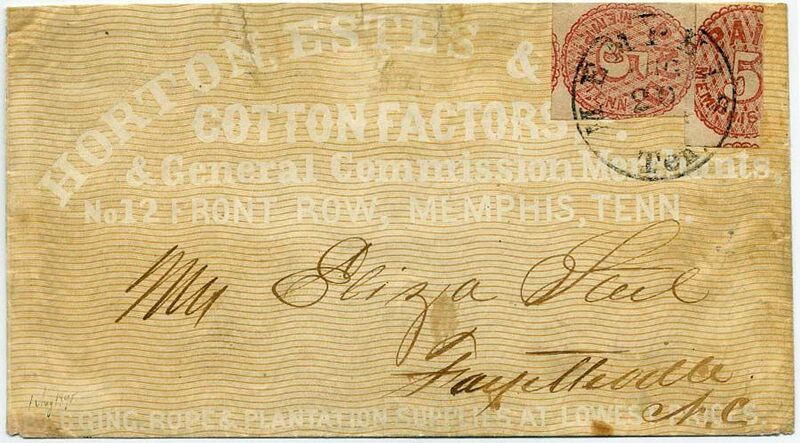 Memphis Tenn., 5¢ red #56X2, two, one has about a third cut away, tied by Memphis / Ten.// Aug / 20 / 1861 cds on pale orange HORTON, ESTES & CO. COTTON FACTORS' OVERALL ADVERTISING COVER to Miss Eliza Steel, Fayetteville N.C., reduced at top and a few sealed edge tears, full stamp slightly creased from being affixed over edge of part stamp, otherwise Fine, scarce use of the Memphis provisional on a cotton-related advertising cover, ex Rudy. $3,000. Nashville Ten. 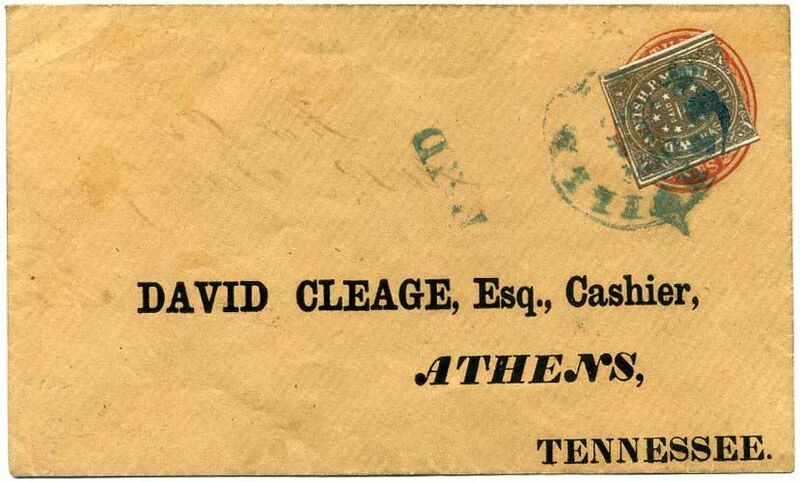 5¢ violet brown #61X5, unusually intense shade affixed over U.S. 3¢ red Nesbitt entire #U10 and tied by blue October 14, 1861 town postmark with matching straightline PAID, printed addressed to David Cleage, Esqr., Cashier, Athens, Tennessee. Embossed Planter’s Bank return card on the top back flap, tiny part of which is missing., Very Fine, Dietz signature on back. SCV $4,250. $4,000. 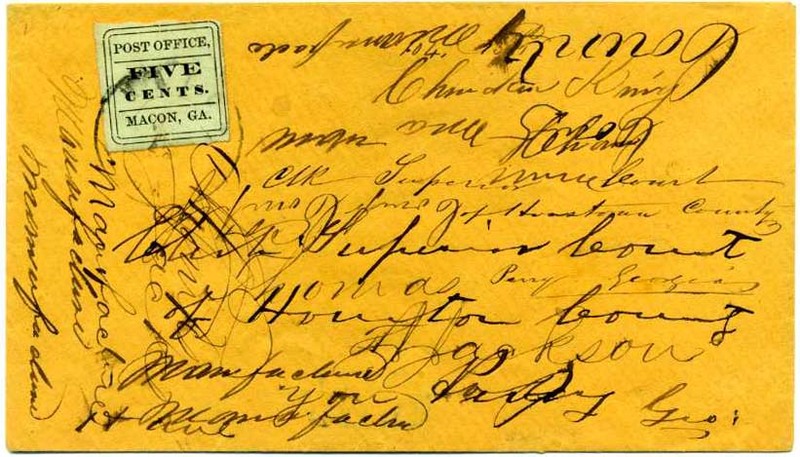 Savannah, Ga. 5¢ black #101XU2 with control marking at right and bold Savannah Paid July 5, 1861 town postmark, addressed to Henry Summer, Pomaria, SC with endorsement of Grandevill Hartkechiff (? ), Sevants Hartkechiff (?). 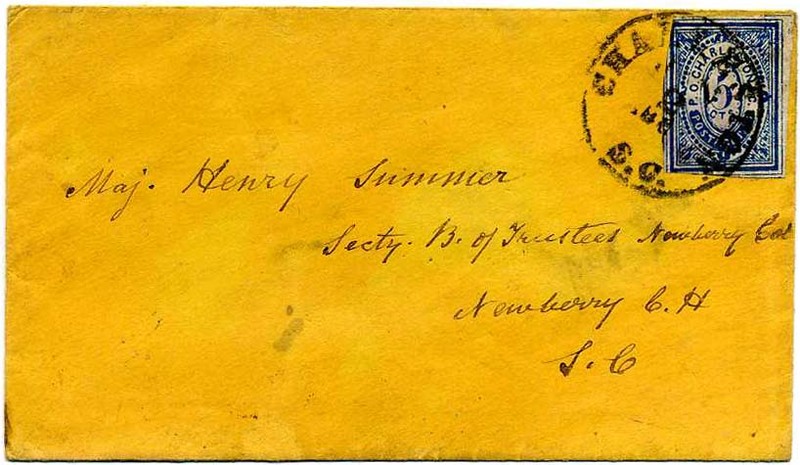 ENCLOSED LETTER addressed to Henry Summer asking for payment of his note with a separate letter dated July 9, 1861 from Wm. Summer at Pomaria to Francis re stores and asking that the reply be sent by Henry (a slave?). Bit of surface scuffing. SCV $600. $300. 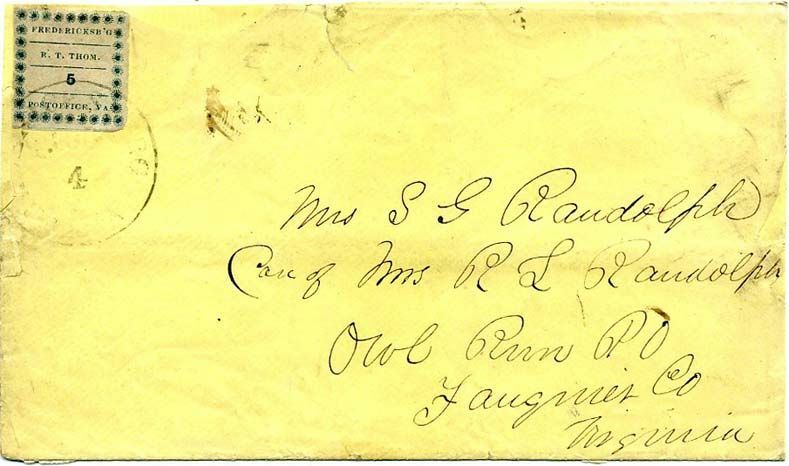 Fredericksburg, Va. 5¢ blue #26X1 (small faults) tied on cover with original corner torn away and re-affixed on repaired cover, addressed to Mrs. S. G. Randolph, Care of Mrs. R. L. Randolph, Owl Run PO, Fauquier Co., Virginia. The well-known Randolph family papers are in the Virginia Historical Society and much information may be found online. The Randolph name is prominent from Revolutionary War days to the present and intertwined with other prominent families such as Carter, Pendleton, Minor, Stonewall Jackson and others. 1983 PF Certificate. SCV $5,500. $3,500. 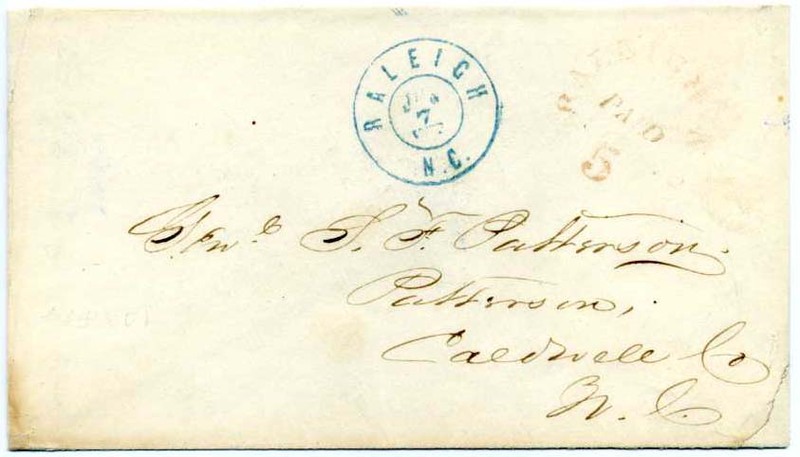 Charleston, S.C. 5¢ blue #16X1 (tiny faults) tied neat Dec 19, 1861 town postmark on cover to Miss O. E. Jarratt, Grassy Point, Spartanburg Dis[trict] S.C. Slight reduction at left and sealed tear at bottom left of cover. 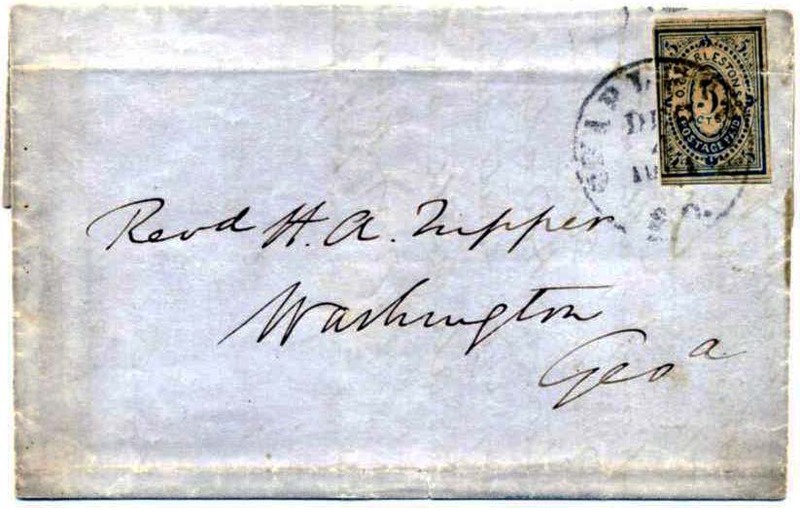 The General Issues went on sale in Charleston on December 7 and Postmaster Huger announced on December 9 that the "local stamps already sold will be recognized, but no more will be issued" (Calhoun, p. 81), signed Dietz, SCV $2,500. $950. 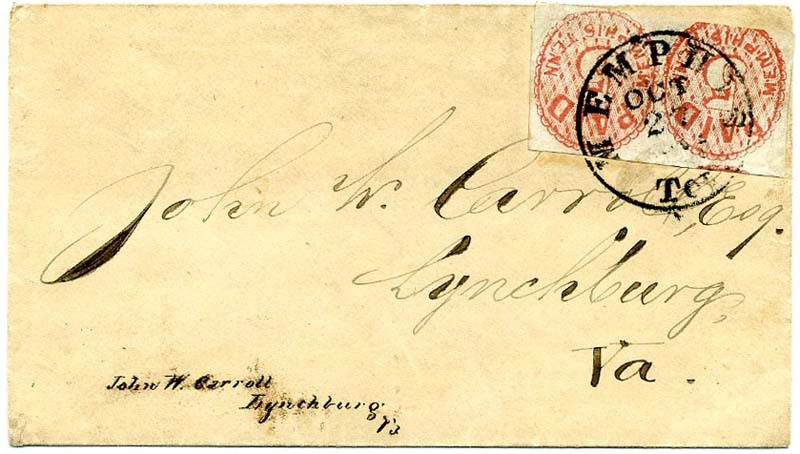 Lynchburg, Va. 5¢ black #52XU2, light strike of town cancel with July [1861) date at right, addressed to D. G. Waller, Amherst Co. House, Va., cover slightly reduced at top and missing back flap, small tears, one just into rim of datestamp, still Fine and rare, the Calhoun census lists only 15 examples of the Lynchburg provisional envelope on any kind of paper, 1996 C.S.A. certificate, SCV $4,000. $1,700. 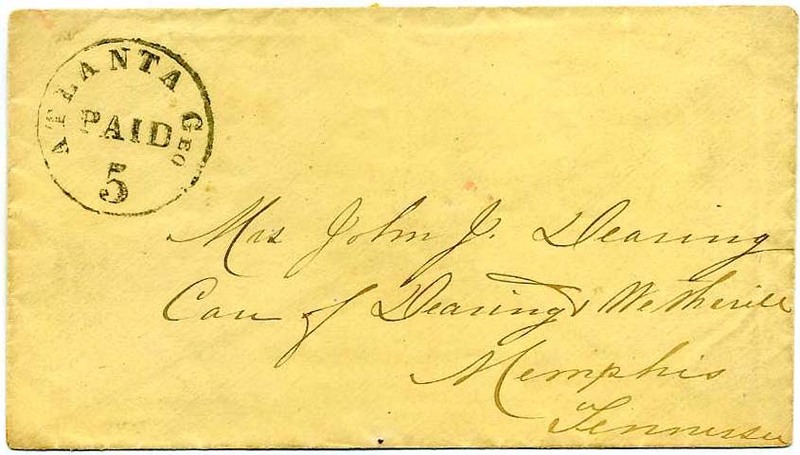 Memphis, Ten, 5¢ red #56X2 pair, positions 38-39, showing part of adjoining stamp at top, tied by October 27, 1861 town cancel on cover to John W. Carroll, Esq, Lynchburg, Va; part of back flap missing. John W. Carroll was a millionaire who made his money in tobacco. SCV $4,000. $2,000.